We all know that I love a good no bake slice recipe, especially when there is cheesecake involved! 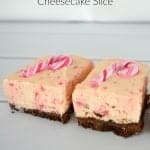 This Candy Cane Cheesecake Slice is soooo easy to put together and is a fun and cute slice to share with family and friends. I’ve mentioned before that I’m not really a fan of peppermint desserts/treats, however I have to make an exception when it comes to Candy Canes! 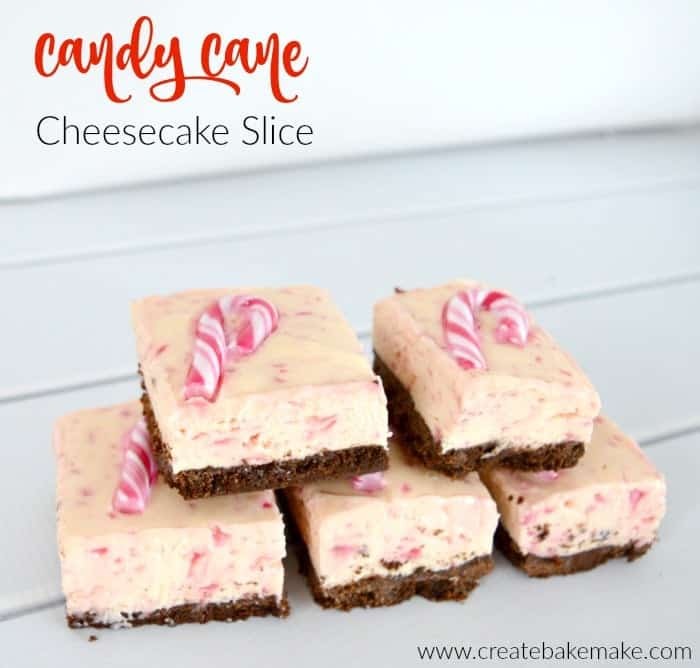 This no bake Candy Cane Cheesecake Slice not only looks and tastes great, but it’s also soooo easy to put together and I think the mini candy canes on top are just too cute! If you are planning to make this Candy Cane Cheesecake Slice for a special occasion, I’d recommend putting it together the day before you need it. While it should be ok to cut after around 6 hours in the fridge, it’s best to leave it to set overnight – the wait is certainly worth it though! Cover the base and sides of an 18 x 28cm slice tin with baking paper – make sure to leave paper hanging over the sides. Crush the 12 large candy canes in a food process or with a rolling pin and set aside until needed. Melt the white chocolate in the microwave – cooking for 30 second spurts and once melted set aside to cool slightly. Add the gelatine to a cup of boiling water and stir to combine. Crush the chocolate ripple biscuits in a food processor, or with using a rolling pin until they resemble fine crumbs. Add the melted butter and stir to combine. Press the crumbs in the base of the slice tin and place in the freezer to chill for 30 minutes. Using an electric mixer, combine the cream cheese, sugar and vanilla essence until smooth. Add the cream and crushed candy canes and mix to combine. Stir through the gelatine mixture and white chocolate. Spoon the mixture over the chilled base and place the mini candy canes on top. Pop the Candy Cane Cheesecake Slice into the fridge for 6 hours (preferably overnight) or until the slice has set. Remove the set cheesecake from the fridge and cut into small squares. Place the chocolate ripple biscuits into the bowl and mix on speed 8 for 10 seconds. Add the butter and cook for 30 seconds, 50 degrees, speed 2. Press the biscuit base into the bottom of your prepared tin and place in the fridge to chill. Add the gelatine to a cup of boiling water and stir to combine. Allow to cool. Break the 12 candy canes into half and place them into a clean thermomix bowl and chop for 2 seconds on speed 7 or until have broken into large chunks. Set aside until needed. In a clean Thermomix bowl, insert the butterfly attachment and add the cream cheese, castor sugar and cream and mix for 30 seconds on speed 2 until you have a smooth consistency. Pour into a large mixing bowl and remove the butterfly insert. Add the white chocolate and vanilla essence (you don’t need to wash the bowl) and chop it for 10 seconds on speed 8. Scrape down the sides and melt the chocolate for 3 minutes at 5o degrees on speed 1. Allow the mixture to cool for approximately 5 minutes. Fold the white chocolate and crushed candy canes into the cream cheese mixture and spoon over the chilled biscuit base. 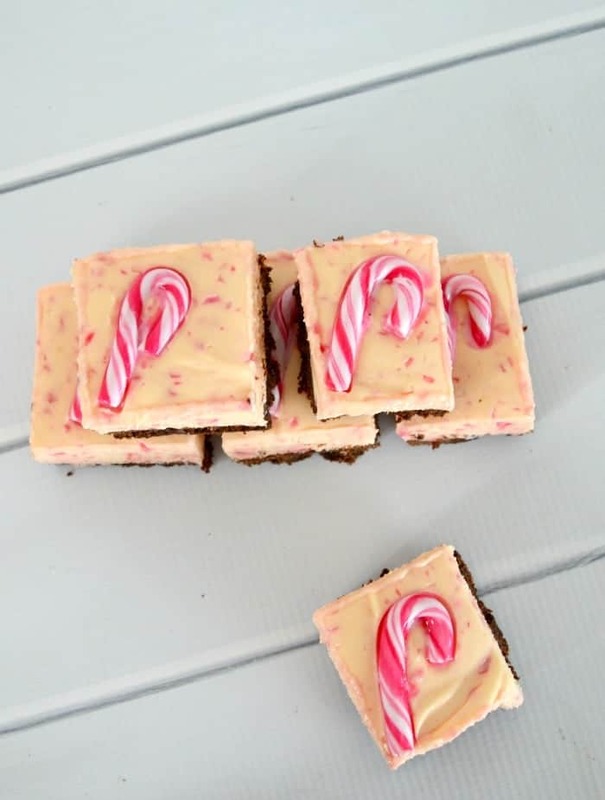 Decorate the top of the cheesecake slice with the mini candy canes. 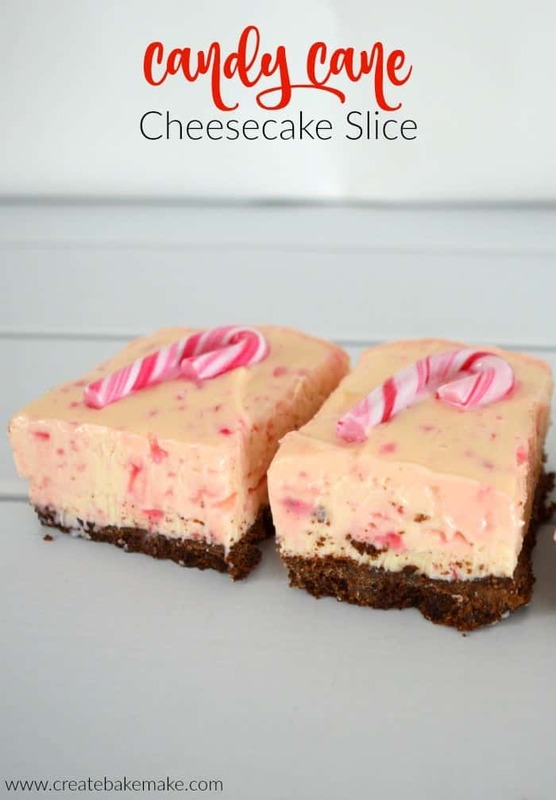 Place the Candy Cane Cheesecake Slice into the fridge for 6 hours (preferably overnight) to set. Cut the set slice into squares. Do you love candy canes too? This slice is too cute Lauren! 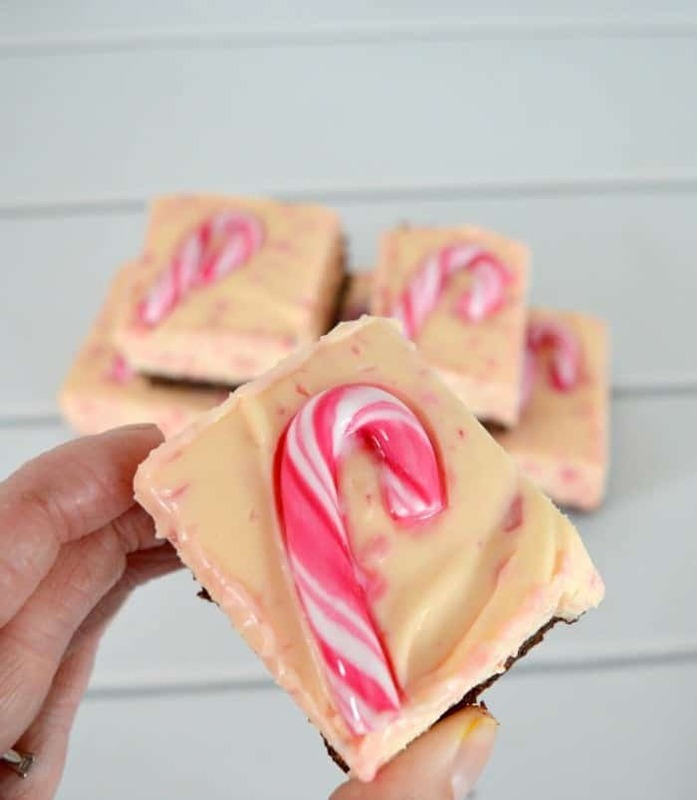 I love the mini candy canes on top and the colour the sweets give to the slice – so pretty! Yum, candy canes and cheesecake my favourites combined. We go through so many candy canes over Christmas, we all love them! I just realized that only one month left until Christmas! This is such a great treat! No bake cheesecake is my weakness! This looks so good Lauren and those mini candy canes on top? Gorgeous!!! So adorably festive! I’m not a huge peppermint fan either, but candy canes are one of my Christmas weaknesses! And nothing beats a no bake cheesecake in the Aussie summer! Delicious! I agree, the candy cane topping is super cute! This is a great christmas treat, and no bake too!